Recently I had the opportunity to sit down and have a chat with Will Sherlin of 3PillarGlobal about my latest book Charting Change on The Innovation Engine podcast. Most of what we talk about in this interview is highlighted in my latest book – Charting Change: A Visual Toolkit for Making Change Stick and my first book Stoking Your Innovation Bonfire: A Roadmap to a Sustainable Culture of Ingenuity and Purpose, the keynote speeches and workshops I deliver around the world on the topics of innovation, change, and digital transformation, and in the revolutionary Change Planning Toolkit™. 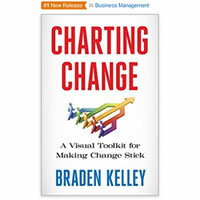 The Change Planning Toolkit™ contains more than 50 visual, collaborative tools to help you beat the 70% change failure rate. You can get the listed number of tools from the Change Planning Toolkit™ by doing the following.